Chevrolet Vega Kammback, 1971 Motor Trend Car of the Year, if you can believe it. To be fair to Mom, there was a deep mantra at work in the family’s automotive life. The steady Tibetan drone of “cars are not toys, cars are not toys, cars are not toys” – helped remind me that cars are the neuron-thin floss that keep us tethered to the Spaceship Life and protect us from floating into deep oblivion and other life and death horrors. All of life’s freedoms, we were steadily reminded, were available with a car. It was one of life’s many marvelous paradoxes. The slavery to your car is the very thing that makes life’s freedoms possible. A functioning car is like breathing. Without it, you were lost. You need a car. You can’t work without a car. You can’t eat without a car. You can’t run away without a car. Your teeth fall out without a car. Your children could be taken away by a judge without a car. You could end up in a mental hospital without a car. Then what? You see what she’s getting at? Mom knew whereof. It was a sobering maternal undercurrent but it never really got put to the test for her personally, because my Mom bought cars that ran forever and through some automotive spiritual magic never, ever failed her. There was a deep compact between Mom and the automobile. She bought the very first Pontiac and even though you could eventually see flashing road stripes through the yellow seat stuffing, that car, with my sun-kissed crayons rainbowing out in the rear window, ran forever. Then she owned a Chevrolet Vega Kammback wagon, one of the worst vehicles ever built in the United States. Defying actuarial tables it runs to this very day, coasting down the right-hand side of the life expectancy bell curve into statistical flatlands. If you substitute “Jesus” (or your equivalent) for the endearments above, you can really start to get a feel for why this worked. And it did work, you Non-Believer. It was a powerful message for two impressionable little kids tethered to Spaceship Life not by seat-belts – it was still the 1970’s, people – but by neuron-thin automotive dental floss. My Dad’s cars on the other hand rarely started – or just often enough to get us a challenging distance away from the house. Much of this was attributable to the fact that he was always getting a hold of aging sports cars nearing the waterfall end of their shelf-life. And the fact that Dad was a lot less careful about his “personal relationship” than Mom. One minute into the first automotive hiccup and he’d curse the heavens like Job. Dad had no words of encouragement for his cars, no dashboard pats. Just mano-a-caro and the smart money on the roadster. One of the delights of my childhood was being ringside for one particular winter breakdown in Connecticut. The MGB vs. Dad “Stamford Breakdown” not so subtly reinforced all of Mom’s key mantra points. 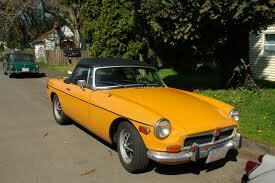 Dad’s orange MGB convertible seized up in 2° weather, pistons locked up tighter than death row inmates. If you ever want an exercise in desperation find two kids, let’s say boys 23 months apart aged 8 and 10, and have them push a car through the snow while you try to jump start a seized engine in the breakdown lane of a major turnpike. Oh, Dad fought alright. With a Shakespearean intensity, he cursed that vehicle and the mechanics past and future who’d worked on it and the long inherited line of owners that led to his ownership and still nothing, if you can believe it. It just wouldn’t go. “English Sonsabitches,” made its muffled way to the rear of the car through the vinyl roof and hazy plastic windows. Dad’s colorful profanity was punctuated by the occasional shudder of frustrated pounding on the steering wheel – a Richter tremor my brother and I could pick up from our battle-ready positions leaning into the rear bumper. During these roadside bouts it was as if every car that slowed down to take a look at the raving Richard III and his two princes was driven by his ex-wife and she was patting the dashboard, shrugging her shoulders and saying “a Car Is Not a Toy, Barry. You should be driving a Vega Kammback, Motor Trend’s 1971 Car of the Year.” The children remained monk quiet, nodding dutifully, heads down, as we privately intoned Mom’s “honey, sweetie, baby please start” prayers in the breakdown lane and stared at our feet, sprinkling hot tears into the accumulating snow drifts. We vowed to leave home and someday have it all be different when we could have Motor Trend Vegas, too, and maybe even get Dad one. Mostly we just wanted the car fights to stop. Dad, a terrible but indefatigable car fighter, was like 0-15 and getting pretty beat up and we just prayed that the car referee would come out and declare TKO, and maybe give us all a ride home so we could watch TV and, frankly, warm up, because it was cold out there in Automotive Hell. A Car Is Not a Toy. On the other hand, and this is no small consolation prize, Dad, in complete contrast to Mom, always had really cool looking cars, an attribute not to be discounted, and probably the seduction that got him into trouble in the first place. No matter what he said about cars mid-bout ringside, the simple fact was he liked shiny things that went fast, could help tan you, and let the air into your highway soul. If the back “seats” wouldn’t accommodate anything larger-boned than an American Girl doll, well then the kids would just have to sit one-leg sideways and work it out. Dad, bless him, would also lend his cars to anyone and was the first to let me use one to learn to drive or go on dates with. Most of his cars were, in fact, also lent to him or purchased on the cheap for I’m guessing the equivalent of disposal costs. If you live in the world of car borrowing, lending, reclaim, and salvage, it’s like an entirely different car universe out there from my mother’s where you. do. not. lend. your. car. to. anyone. for. any. reason. In Dad’s world, you have borrowed your spaceship and noticed, because you are not too terrified to lose sight of it and look around, that there are, lo and behold, all kinds of spaceships distributed about the heavens behind you. Cars it turns out are, like, everywhere, Mom. It’s like there is a whole economy built on making them available. You can even rent them. You just bounce around between them indefinitely, abandoning them and jumping for the next one like a trapeze artist. The amazing thing was that no matter what happened to Dad with his last car, a new one came along from somebody or somewhere, defying Mom’s world-will-end fears. Mom was pressed up against her spaceship like a terrified rock climber. But Dad’s car god came in the interval between cars, always re-emerging with a new, shiny vehicle, the bounty of an all-forgiving, all-loving god; Mom’s came in the single, unbreakable subservient bond to her car god. God-bless them, both found a way to get to work, keep their teeth in their heads, and stay out of the mental hospital. One by works. One through faith. Many paths. One God. Amen. 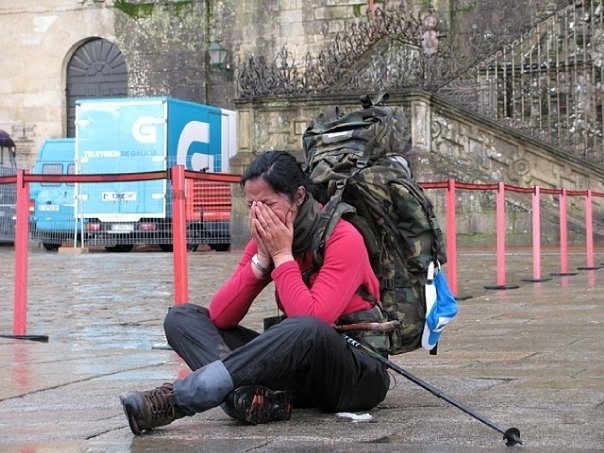 As for the road I have taken, draw your own conclusions, but note that I have never had a car break down on the roadside. Not once. If you are interested in receiving exclusive content from Adam Nathan, including previews of his upcoming book Walking Backwards (A journey of a thousand miles on the Camino de Santiago), essays, and access to material currently being developed, please send an email to anathan@teambrainbox.com with “Adam Nathan Newsletter Offer” in the subject. You can not believe how weird it is to read an author and know the people, especially the main character. Your stuff is just soooo good, outrageously good. Such fun for me to know a great author. A famous author. No credit to the walk. Your writing was just as extraordinary long before you did your trek. btw your main character is filling Heaven with screeches of joy. Like at the movies or the theater. Thank you, Eileen. “Screeches of joy:” that’s exactly right. She was right here for a second when I read that. Love it! I can picture you Dad on the side of the road :o) and your Mom loving her car!